Arnie just added some key fucntionality to the Calendar Snack Detail page. 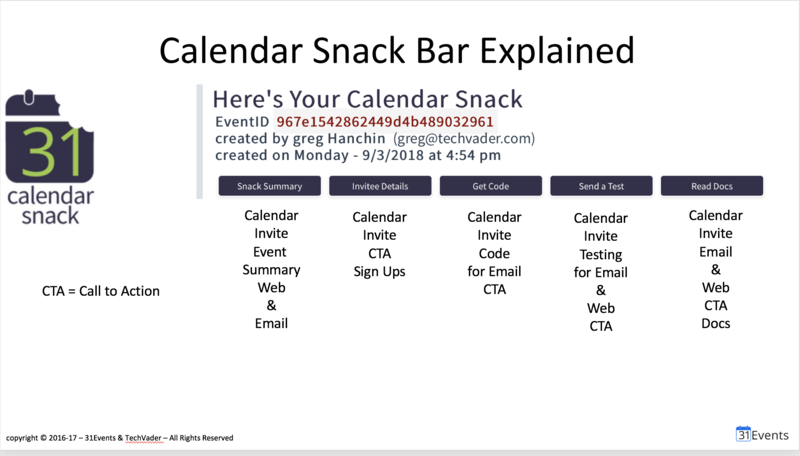 The active buttons now work from the Calendar Snack reporting page when you add us or “Invite us” to your Calendar event off your personal calendar like Google, Outlook or Apple native calendar. The buttons are Snack Summary, Invitee Details, Get Code for Email CTA – MailChimp- (Others coming soon), Send a Test to your self Web CTA Form, and Documentation.